A hamper full of artisan produce from Causeway Speciality Market has been presented to Barbara Millar from Belfast. 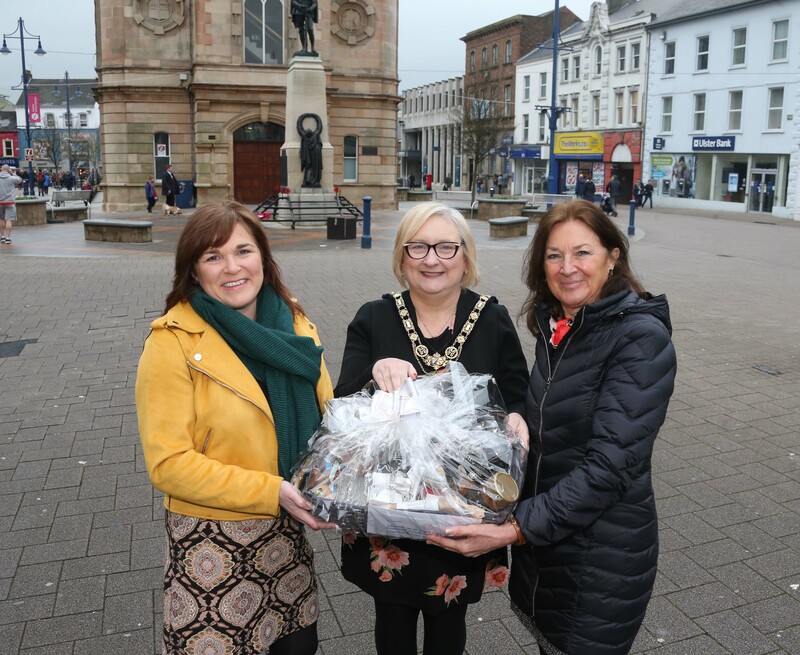 The give-away was included in Causeway Coast and Glens Borough Council’s first E-zine to registered users of free On-Street WiFi in towns across the Borough. The service allows shoppers, visitors and members of the public to get connected for free in Ballycastle, Ballymoney, Coleraine, Limavady and Portrush. 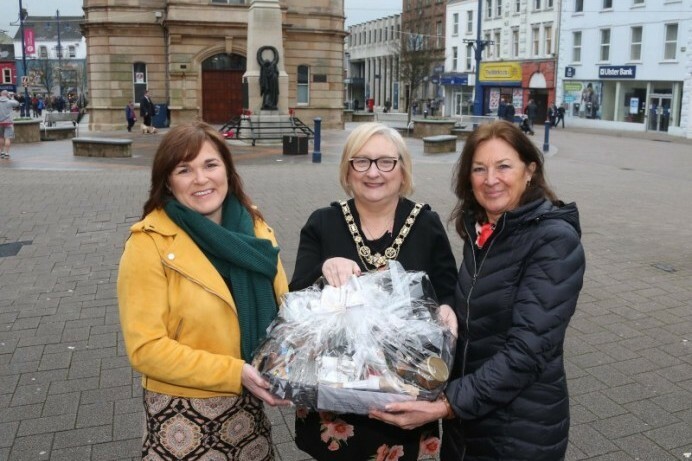 The Mayor of Causeway Coast and Glens Borough Council, Councillor Brenda Chivers said: “The provision of free On-Street Public WiFi is a tremendous asset which enhances the Borough’s reputation as a great place to work, live and do business. Since its introduction the facility has been used up to 4000 times every month in each location, contributing to positive visitor experience which enhance the vibrancy and prosperity of our town centres. Free On-Street Wi-Fi is available in Ballycastle, Ballymoney, Coleraine, Limavady and Portrush and can be accessed by searching for Ballycastle Free WiFi, Ballymoney town Wi-Fi; Coleraine Wifi; Limavady WiFi and Portrush WiFi Spark. Barbara Millar, who won a hamper full of artisan produce from Causeway Speciality Market after entering a competition in Causeway Coast and Glens Borough Council’s first E-zine to registered users of free On-Street WiFi which is available in Ballycastle, Ballymoney, Coleraine, Limavady and Portrush, receives her prize from the Mayor of Causeway Coast and Glens Borough Council Councillor Brenda Chivers and Town & Village Manager Julienne Elliott.